Just a few days ago I commented on how the Notifications screen had grown quite a bit over the last few months, and with the brand new beta, two more settings join the list. 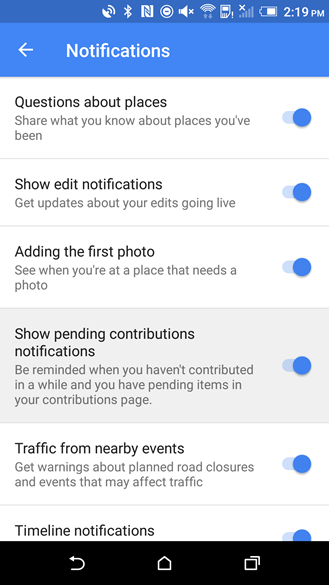 The recent additions are titled "show pending contributions notifications" and "driving notifications." 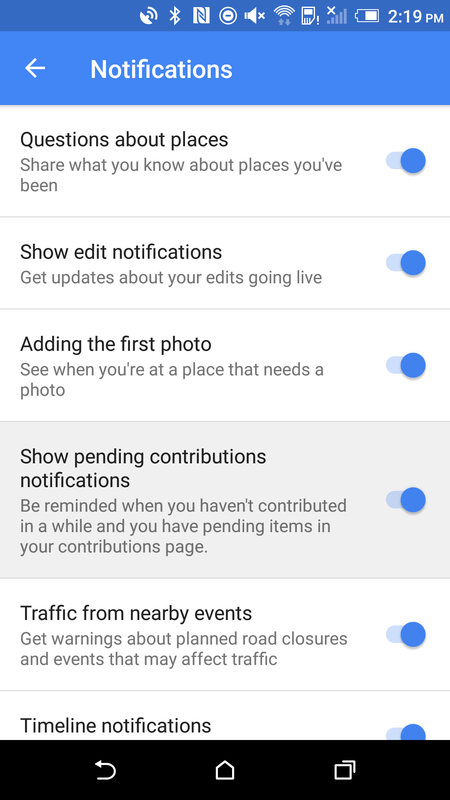 The first setting, "show pending contributions notifications," will occasionally fire off notifications to remind users after they've visited a few places but haven't yet given reviews. Whether you want this on or not will almost certainly depend on how much you want to be a Local Guide. If you're determined to rate and review every place you visit, this could be a great motivator. It would also serve to be a good reminder if you happen to wander through a place without realizing you haven't yet reviewed it. On the other hand, if you're not interested in climbing the ranks as a Local Guide, this is probably going to be very annoying. 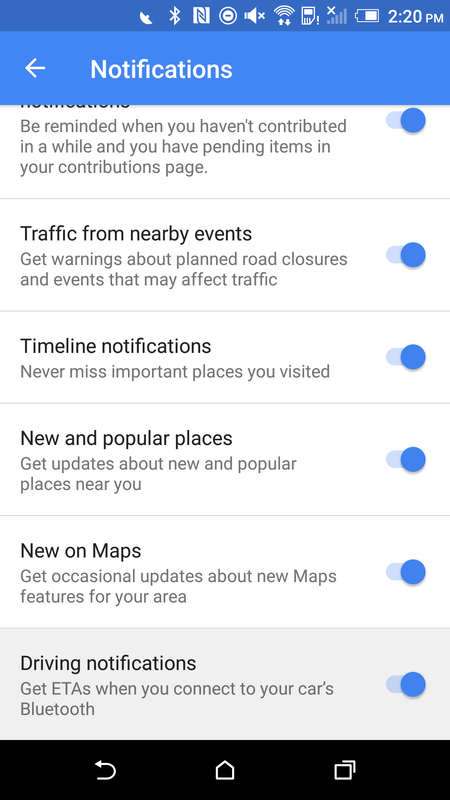 Fortunately, a teardown of Maps shows that there's a very good chance we'll get an opportunity to opt out when one of these notifications appears. It's entirely up to you if you want to turn this off in advance or leave it on to keep the reminders flowing. 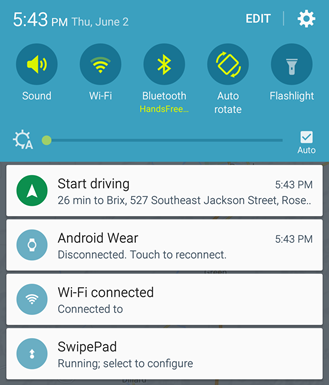 The second setting, "driving notifications," appears to control a notification that has already been around for a little while. 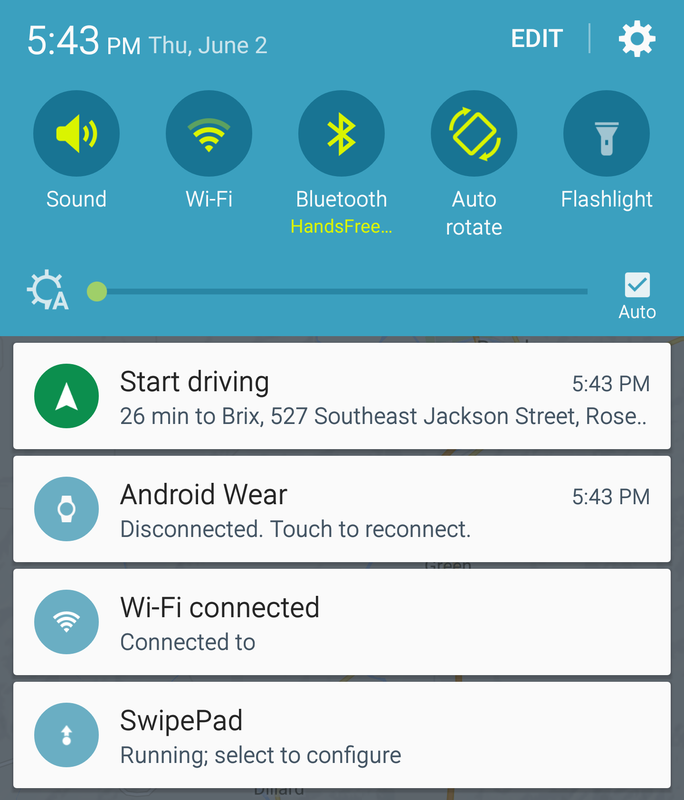 When a phone connects to a car's Bluetooth transmitter, sometimes it will display a notification like the one pictured above, which may contain ETAs to recent destinations or simply offer to activate Driving Mode. If you don't care for that notification, this toggle should be able to turn it off for good. There's no point in denying it, some apps need a splash screen, especially if they are running on reasonably underpowered hardware. 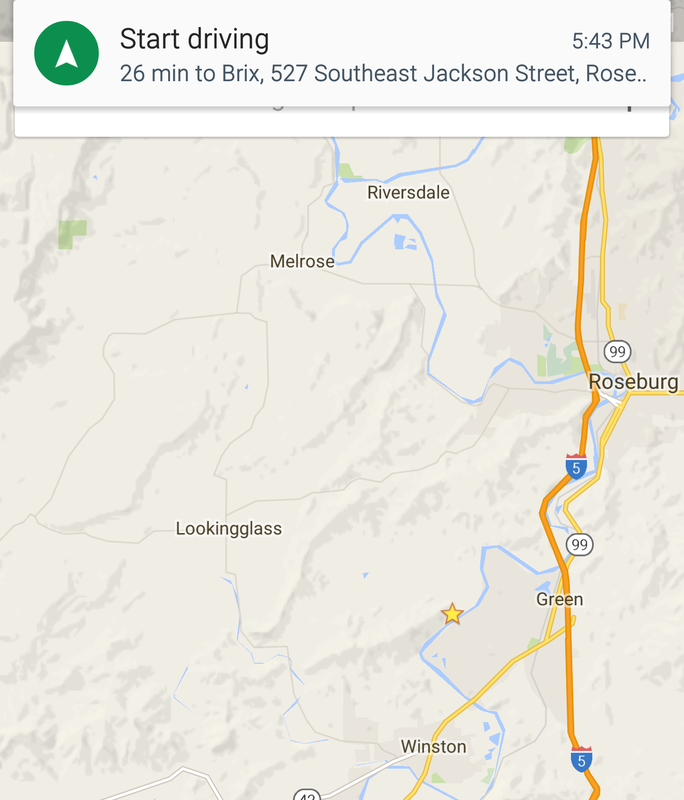 If you've tried using Maps on Android Wear recently, especially on the 2.0 Preview, you probably know what I'm talking about – startup times are long enough that the screen often shuts off before Maps is loaded. Since the last version of Maps started up with a plain white screen, it looked like the watch had frozen. 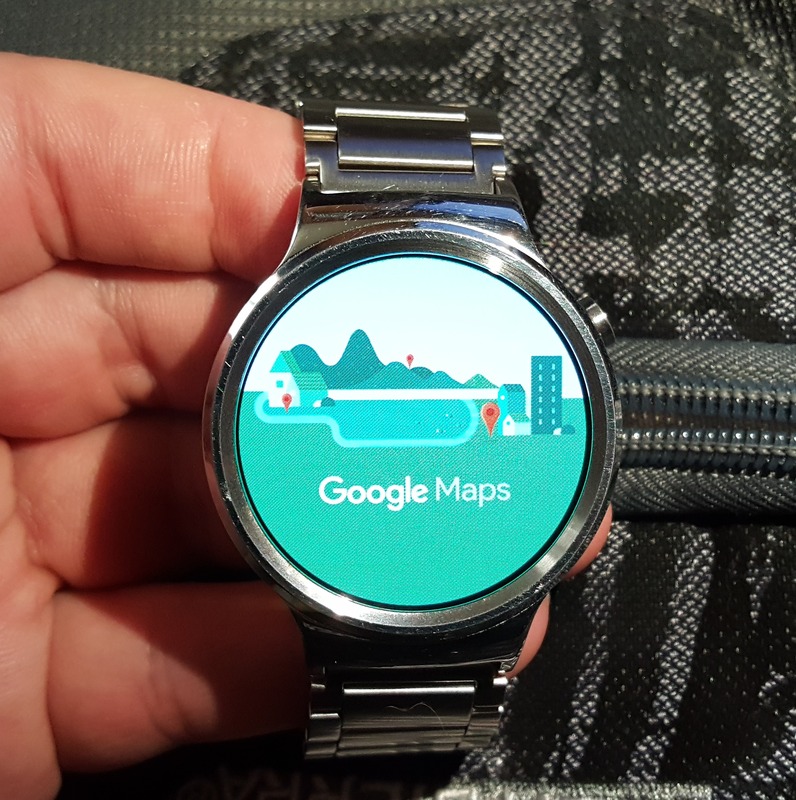 Version 9.27 gives a little more life to the watch face with a picturesque landscape in Google's preferred artistic style. I think it looks good. It's certainly better than staring at a white screen for five seconds. 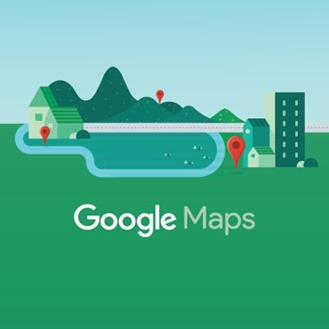 There's nothing like a polite greeting to give you a smile on a hectic day, and it looks like Maps is going to be all about turning that frown upside-down. 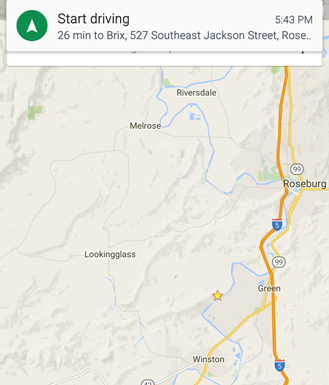 Alright, that's clearly an exaggeration, but Maps really does appear to be planning a welcome message of some sort. The phrases are tried and true classics: good morning, good afternoon, good evening, and a simple "Hello" for the nighttime crowd. There are variants with and without a spot to insert a person's name. There aren't any hints to explain where these strings will be used, but something like this will probably find its way in as a welcome message during app startup, or maybe in the short slide tutorial that plays during the first run.